Ever seen one? Neither had we. Wanna see more? Click through. 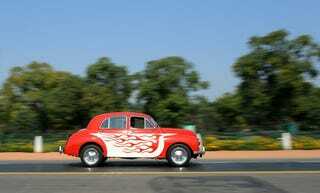 Flamed-up Hindustan Ambassador, you had us at hello. It's like Mr. Deeds Goes To Visakhapatnam! The cars you see here were part of a rally held this week in the Indian capital of New Delhi. The rally was held to raise awareness of pollution in the Yamuna river, which flows through the city. We don't quite understand how driving a bunch of smoggy old cars through a major metropolitan area helps the environment, but hey, we got to see some sweet Hindustan (a.k.a. Morris Oxford) flame job, so who's complaining? Also, what the elephant blue blazes is that golden thing on the left? Are those Mercedes-Benz W108 headlights? We're going to have bad dreams — the good kind — for weeks. Someone build us one of these things. Now.